This is a series dedicated to giving the middle finger to the food industry – more specifically to the food marketing industry. Because I used to work in advertising, selling “food” products that I wouldn’t touch with a 10 foot pole. And neither should you. Here’s why. Ok, ok. I get it. I’m looking to lose weight, this is the perfect snack! Right? Well, it appears to be healthy. But what’s in it? For the record, I define “healthy” food as food that is real, whole, nutrient dense and comes from the earth. Typically I’d go through the ingredients one by one and break it down. But in this case, I took a look at the ingredient label and almost fell over. The sheer quantity and complexity of the list tells us that this is not real, whole food at all. But even that fact aside – is this a good weight loss food? Let’s wander through the ingredients and find out. I had to actually go through and highlight all the different forms of sugars and sweeteners to keep track of them. And I may have even missed some. Good god, you have to have a PhD to read stuff like this! 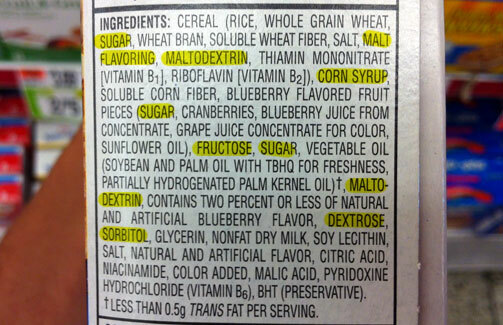 Because ingredients are listed by volume (greatest to least), sugar is not the first ingredient. But if you combined all the different forms, I’m quite sure that these bars are primarily made of sugar. Sugar = empty calories. You’ve heard that before. So yes, only 90 calories per bar but they are like eating air. Actually, air would be better for your body. Because while air contributes nothing nutritionally, neither does sugar. But sugar has the added bonus of being a highly, highly addictive substance. So once you start eating these bars, you’ll probably want another. And another. And then some ice cream. And later some chocolate. And then some candy. And as you munch your way through the day, through the week, you are consuming many more than 90 calories. In fact, you are placing yourself squarely inside a food marketer’s dream come true. Because you’ll never lose weight for good if you’re addicted to sugar. So you’ll keep buying these sugar-filled products that promise weight loss. And the sugar will keep you hooked, keep you buying, keep you filling Kellogg’s pockets with your hard earned cash. Yup, there’s rice. That’s the first ingredient, technically. White, processed rice of course. It doesn’t say that. It would say “brown rice” otherwise. So we’re talking about a grain stripped of it’s nutrients, left with mainly its carbohydrates. Which, when they hit your bloodstream, break down almost immediately to sugar. Refer to the previous section. Vegetable oils are cheap, almost always genetically modified, man-made junk. And the word “hydrogenated” indicates an oil that has had its hydrogen molecules rearranged. Natural? No. Weirdly, these are highly sweetened cranberries with a touch of blueberry juice. My guess is that cranberries are cheaper than blueberries, so they are used to fake the blueberry look and taste. Um. I guess there’s some fruit in there, kinda. It’s just weird. You see this word, you are looking at a processed food product. Simple as that. Soy lecithin is a partial food – actually a byproduct of soybean oil production. It’s cheap and it holds stuff together. Like bars. Preservatives. These bars will last forever. That’s not a good thing, when it comes to food. Yes, these scores are a little arbitrary, but you get my point. 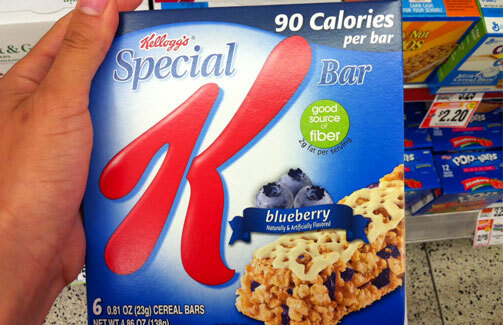 Special K bars are nothing close to real food and could very well cause you to GAIN weight, despite what the packaging and marketing might have you believe. They are empty calories with questionable additives. It appears to be healthy but it definitely…is not. Check out all the posts from my “It Appears To Be Healthy, But Is It?” series right here. What’s your favorite real food snack or breakfast on-the-go? This post is part of Keep It Real Thursdays.